RT Series SlopeAlert Tilt Switches - Rieker Inc.
Rieker tilt indicating instruments are utilized to provide a visual or audible alert to warn operators of steep slopes and can be configured to disable (or shut-off) equipment in the event of rollover - especially useful for off-road construction equipment. These can be used in any industry where a tilt warning is needed or required to provide a safer condition. 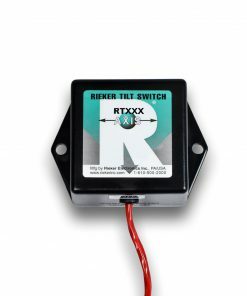 Rieker tilt switches vary from an economical approach if you are only looking for a simple tip over warning (or "on/off" switch) as with the SlopeAlert, to a constant feedback / visual readout of slope angle with the versatile, semi-custom RDI Series of Digital Inclinometers. Manufactured tough for off-road abuse and extreme weather, all models offer easy to identify alert characteristics.